Now I know why several people have said to me, “St. Lucia is my favorite Caribbean island”. While all of the islands I have visited are beautiful, the drive from the airport showed me immediately that the land and seascapes of St. Lucia are particularly striking. 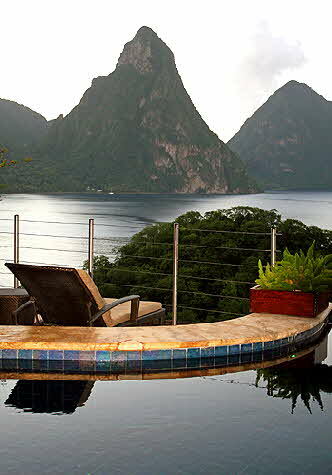 The pointy Piton Mountains alone are enough to make the place a standout. I had a chance to try both Anse Chastanet Resort and Jade Mountain Resort - two properties owned by Nick and Karolin Troubetzkoy who are very hands-on and always working on improvements and new ideas. 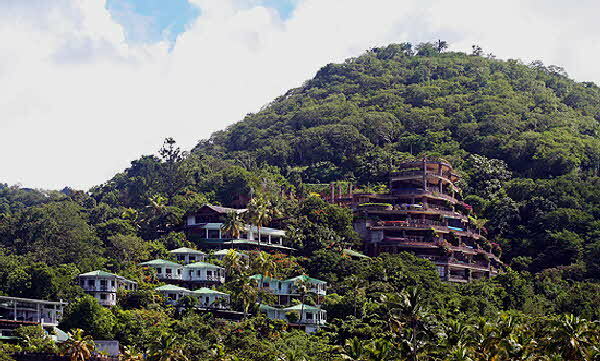 Anse Chastanet begins on its own beach and extends up into the mountains in levels. Jade Mountain sits above Anse Chastanet’s 600 acres and is even more upscale with views of the Pitons that can only be called spectacular. My spacious room at Anse Chastanet was air conditioned and just steps from the beach, where there was a bar open most all day and evening. I could simply lift the flag on my beach chair and get immediate service. I found myself taking advantage of the different fruit-flavored daiquiris (virgin during the day and not so virgin in the evening) and other specialty cocktails - many of which are made with fresh organic fruit grown by the resort. One of the restaurants, Trou au Diable, is also right on the beach and changes into the Apsara Indian restaurant depending on the night. Climb the stairs or use one of the many courtesy phones on the property (your room does not have a phone) to call for transportation up to the Treehouse Restaurant and bar areas, where you checked in. Breakfast is served there as well with plenty of local birds around who will gladly take food from your hands (or off your plate.) You will see water guns on the railings surrounding the restaurant if you want to squirt the little squirts away from your food. Anse Chastanet has its own particular charms, but there is no denying that Jade Mountain is just special, which is why Conde Nast Traveler readers have voted it the top resort in the Caribbean for two years in a row. Most of the rooms called “sanctuaries” have their own enormous infinity pool and only three walls. 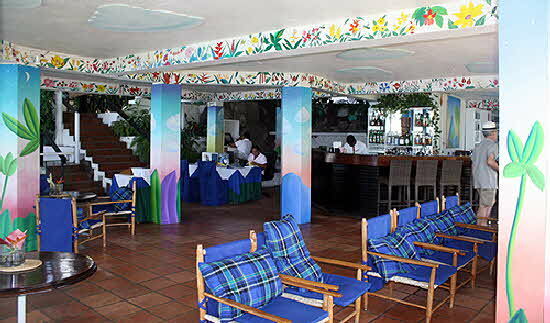 The fourth “wall”� is open and overlooks the sea and the Pitons. 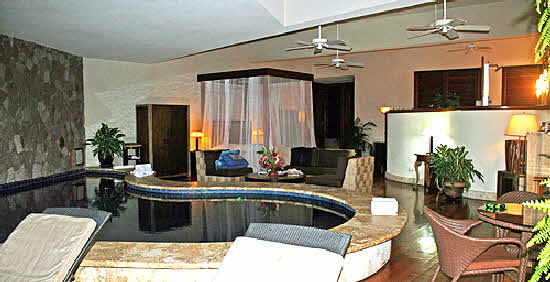 My sanctuary was very large with a balcony, living area, and a few steps up to the toilet, open shower, and Jacuzzi. The resort is so elevated and across the sea from the mountains that you needn’t worry about prying eyes, but since there is no door around the toilet, I suggest only sharing the room with a romantic partner. 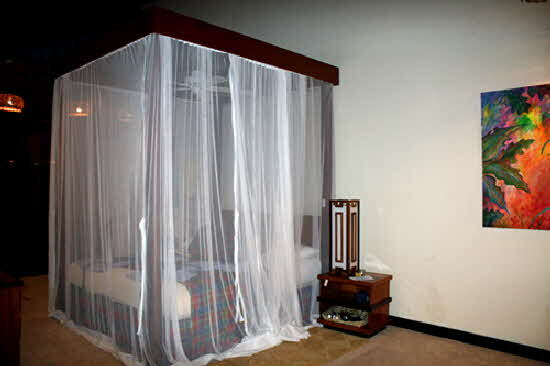 The ceiling fans make air conditioning unnecessary, and the beds are covered with white mosquito net canopies (as is also the case at Anse Chastanet). The Jade Mountain Club restaurant is often voted in lists of the best in the world. The setting is decidedly romantic, which, along with the stunning sanctuaries, is why it’s a popular resort with honeymooners. Everything I ate at Jade Mountain Club and the Anse Chastanet restaurants was excellent. The Troubetzkoys and their staff pay great attention to detail, and they have found top-notch chefs and sommeliers. One of those details has to do with chocolate. Jade Mountain has its own small chocolate laboratory that makes 100% St. Lucian chocolate from tree to chocolate bar. It’s the only place that does this. The resort grows its own cacao trees, harvests the beans, and makes its own bars that consist only of organic cocoa beans, organic sugar (also grown on the island), and perhaps a flavor such as lemongrass or cinnamon. You don’t get fresher chocolate than that! Anything chocolate that you eat at the restaurants from the chocolate croissants at breakfast to the creative dessert presentation I had at Jade Mountain Club comes from the on-site lab. It’s quite impressive, and you can take “from tree to chocolate bar” tours or workshops in which you make your own fudge. The chocolate theme even carries over into the spas, where you can have a chocolate facial, body polish, or mocha massage. The other tours and excursions to choose from are too numerous to mention, but you can sail, snorkel, dive, kayak, bike, whale watch, zipline, shop, or take part in several other activities. One of the most popular is the “jazzy cruise” held on Thursday evenings to view the sunset from the water while listening to a jazz band. When you want to be pampered, each property has its own spa. The resorts also have a new bird watching program that takes you all around the island, if you like, with a guide to show you the most beautiful birds on display in the forests. The St. Lucia Parrot is probably the most coveted, along with three hummingbird species. Hummingbirds are readily seen feeding from the flowers at both resorts, but the parrots take a bit more work. You can choose to spend an entire week bird watching or simply add a day or half day to a more diverse itinerary. I didn’t find the island to be especially buggy during the time of year of my visit, but Stetson sent me one of their No Fly Zone hats by Dorfman Pacific to try out. I used it during my bird watching excursions in the forests and found that the permethrin insect repellent-treated fabric did a good job of keeping the mosquitos away. I tried the STC199 model, which has a mesh area around the head for air flow, an all-around brim to protect from the sun, and a piece that can be pulled down to cover the back of the neck. It was cool enough in the heat, and I can’t wait to try it in a malaria zone. The permethrin is supposed to last for 70 washings. Whether you choose Jade Mountain or Anse Chastanet, you can’t go wrong. You’ll either be swimming in your private infinity pool while looking out at the Caribbean Sea and St. Lucia mountainscape or sipping a fresh pineapple daiquiri on the beach as you sample a dessert made on site from some of the world’s finest and freshest chocolate. Yes, it really is nirvana. © December 2014 LuxuryWeb Magazine. All rights reserved.